KIEV, Ukraine -- The Ukrainian president Viktor Yanukovych gained further ground in Ukraine in local elections. 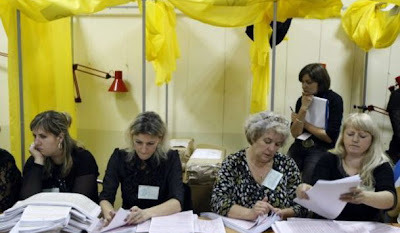 Election officials counting ballots at a polling station. Yanukovych's party easily outperformed his main rival of former Prime Minister Yulia TymoshenkoYulia Tymoshenko. Yankukovych's Party of Regions received 36.2 per cent of the vote against 13.1 per cent for the Fatherland Party of Tymoshenko. However the elections were marred by a low turnout and cries of fraud from representatives of the Fatherland Party and also some western financed election observers. The turnout was less than 50 percent leading a Fatherland critic to say:"the majority of Ukrainians did not want to take part in the farce which the ruling clique thrust upon our state." Actually some countries would be happy to have nearly 50 per cent turn out in local elections! The Fatherland party says that it will not recognizes the results in some areas. Although it will be several days for full results to emerge a Party of Regions official claims that his party would form a majority in 23 of 27 regions but only in alliance with other parties. There were no elections in Kiev the capital and results for mayor in other major cities were not yet clear. There were no western full-fledge monitoring mission but one group that did monitor the elections Opora which is western funded concluded that the vote was not democratic. The group claimed that some candidates were unfairly excluded, and that opposition groups were often not fairly represented at vote counting. Representative Dmitry Gnap said:"There were so many violations that we cannot say that it was democratic, fair and open,"